© Remi OCHLIK/IP3 - Cairo Feb. 03 -- Tahrir Square . 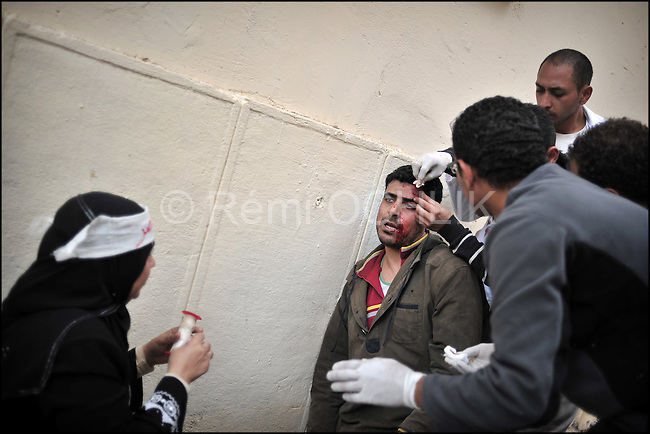 In an empty street close to the "Frontline" between pro and anti Mubarak, doctors and nurses take care of hundreds Egyptian injured by stones...Chaos intensifies, violence spreads. Protesters and regime supporters fought in a second day of rock-throwing battles at a central Cairo square while new lawlessness spread around the city. New looting and arson erupted, and gangs of thugs supporting President Hosni Mubarak attacked reporters, foreigners and rights workers while the army rounded up foreign journalists. As bruised and bandaged protesters danced in victory after forcing back Mubarak loyalists attacking Tahrir Square, the government increasingly spread an image that foreigners were fueling the turmoil and supporting the unprecedented wave of demonstrations demanding the ouster of Mubarak, this country's unquestioned ruler for nearly three decades.